Palm Giving Up iTunes Sync? There has been no word from Palm on whether or not iTunes sync will return. Many thought it might debut in webOS 1.2.0, but it was quickly debunked. So where does that leave this feature? In looking at the wording on Palm’s product descriptions for both the Palm Pre and Palm Pixi, it doesn’t appear this feature is going to return any time soon. 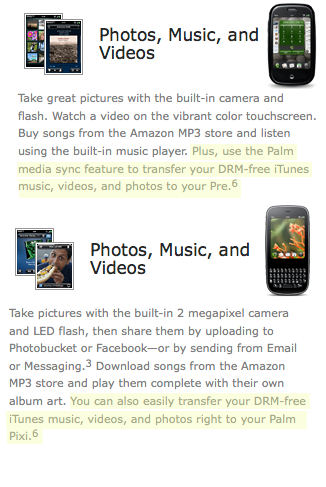 The Palm Pre lists support, but now includes the footnote, “Compatible with iTunes 8.2. Compatibility with future versions not guaranteed.” The Palm Pixi description is cleverly worded and alludes to support for getting non-DRM music from iTunes to the Pixi, but gone are references to the media sync feature. It was a useful feature and certainly one that will be missed by those who manage their music with iTunes. There are a number of alternatives including DoubleTwist, Missing Sync for Palm Pre and the old standby that is drag & drop. If you stick with iTunes 8.2, the feature will work with the Palm Pre, although we’re not sure if the Pixi will support media sync in iTunes 8.2 despite the product description. Could Palm include this in a future update? Sure, but the writing is on the wall or should we say Palm’s website. Is it too early to ask for Palm Desktop with support for iTunes playlists? I use a program called Thrupp http://www.utsire.com/thrupp/ with my phone. I don’t own a Pre yet, awaiting a Pixi, but it may work for it depending on how it has it’s music. Can’t wait to get mine!